I love chocolate fudge, and over the years I have collected quite a few recipes. One of my favorites is this smooth and creamy Chocolate Marshmallow Fudge, also known as Fantasy Fudge. This fudge is different than old fashioned chocolate fudge which is made from a mixture of sugar, butter, and cream that is cooked to the soft ball stage, cooled, and then beaten until creamy. This Chocolate Marshmallow Fudge simply involves boiling evaporated milk, butter, sugar, and marshmallow cream for just five minutes (a candy thermometer is not absolutely necessary) and then stirring in some dark chocolate, vanilla, and chopped nuts. So easy and so good. Perfect for gift giving. A few notes on the ingredients. Evaporated milk is sold in cans and it's unsweetened homogenized milk which has had sixty percent of its' water removed. Evaporated milk is not to be confused with sweetened condensed milk which contains sugar. Marshmallow Cream or Fluff is a thick, soft and fluffy, very sweet marshmallow flavored mixture that is made from corn syrup, sugar syrup, dried egg whites, and vanillin. It can be found in most grocery stores and is sold in either jars or tubs. Always check the expiry date. When marshmallow cream in used in fudge making, it coats the sugar crystals keeping them nice and small, thereby preventing sugar crystallization and a grainy textured fudge. Also, you can use either a good quality semi sweet chocolate or even your favorite semi sweet chocolate chips. If you prefer your fudge without nuts you can leave them out altogether or replace them with dried fruits, like dried cranberries, cherries or raisins. While I like to use pecans and walnuts, other good choices are hazelnuts, almonds, pistachios or cashews. To Toast Nuts: Preheat oven to 350 degrees F (180 degrees C). Place the pecans or walnuts on a baking sheet and toast the nuts for about 8-10 minutes, or until lightly brown and fragrant. Cool and then coarsely chop. Chocolate Marshmallow Fudge: Line the bottom and sides of a 9 inch (23 cm) square pan with aluminum foil. Pour the evaporated milk, butter, sugar, salt, and marshmallow cream into a heavy bottomed 2 1/2 - 3 quart saucepan. Place over medium to medium low heat and, with a wooden spoon or heatproof spatula, stir the mixture constantly (to prevent burning) until it comes to a boil. Adjust the heat and let this mixture boil for 5 minutes, stirring constantly. During this time the mixture will caramelize slightly and if you test the mixture after 5 minutes with a candy thermometer it will read about 230 degrees F (110 degrees C). Remove the saucepan from the heat and immediately add the coarsely chopped chocolate (or chocolate chips), stirring until the chocolate has melted and the mixture is smooth (can use a wooden spoon or a wire whisk). Stir in the toasted nuts and vanilla extract. Immediately pour the fudge into the prepared pan and smooth the top. Let stand at room temperature until cool (about 1-2 hours). Then carefully remove the fudge from the pan by lifting the edges of the foil. 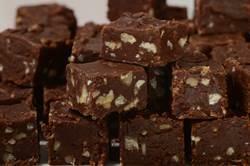 With a long, sharp knife cut the fudge into one inch (2.5 cm) pieces. Well wrapped, the fudge can be stored in the refrigerator for several days, or it can be frozen for several months. Makes about 81 - one inch (2.5 cm) pieces of fudge. Preparation time 45 minutes.